Full page ad is most newspapers today. 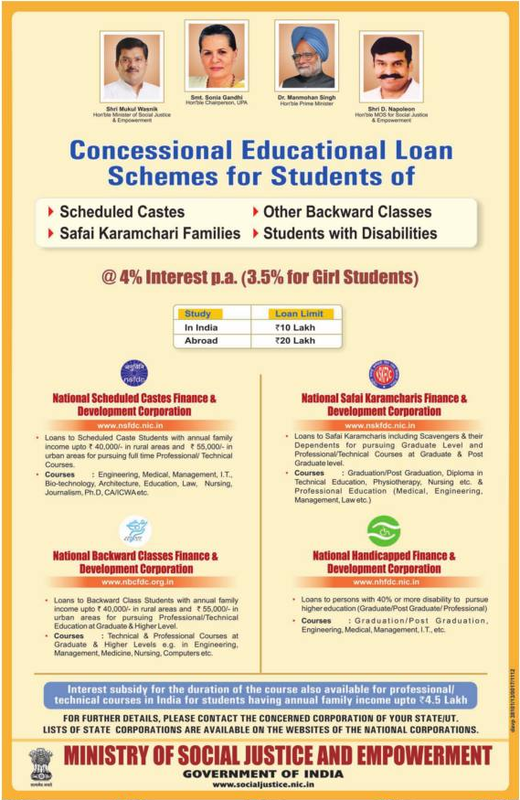 Student Y(OBC) from family < 55,000 pm pa (6.6 Lakhs) gets a government loan at 4%. As pointed out by Sudhir Kudva, the ad indeed says total family income Rs 55,000 per annum not per month. I stand corrected. This figure is barely above the poverty line and one wonders about the ability of people to even take advantage of it. If the cutoff is indeed 40,000 pa rural and 50,000 pa urban, one wonders about the very intention of announcing this scheme. Other than garnering publicity for the various ministers. This excludes all but the most impoverished. In the construction industry, a helper woman gets 250-300 per day. They work 6 days a week. Over limit for the scholarship for her child. This is not including husbands pay. In fact, if you use the NREGA rate (upto Rs 170 per day in some states) as a guideline – a single earning person will make 42-56,000 p.a depending on how many days they work. This puts them way above the rural cutoff of 40,000 p.a. This is even more disturbing because at this level of wretchedness there is no need to discriminate on the basis of caste. Attaching groups of people to adhoc completely unmonitored benefits is the defining characteristic of Indian politics. I do not recall there being a clamour for foreign educational loans for OBCs – yet the government thought it was critical to keep the goodies coming. This is because they know what keeps the status quo ticking and you dont. Anyone who has been through the bank loan process for education knows how difficult it is. Those who think the classification of castes is about disgruntled IIT/IIM students think again. These benefits are what divides the people and the fact that they arent monitored at all keeps it that way. The castes who read such full page initiatives by the government will not pay any heed to big ticket items such as corruption or terrorism or inflation at the polls. It is human group dynamics at work. If they rebel against their benefit protector, they could be subjected to scrutiny and stand to lose out while others in their exact same position who fell in line will take their share. So its not about Yeddy or Raja – it is about removing the adhoc-ness. The social justice beneficiaries must be subject to scrutiny and a critical mass of free agents maintained in the system. As expected former Telecom Minister A. Raja has “dragged in” the PM and FM in court. The court was hearing argument related to framing of charges against the accused. Raja’s defence also argued that there was no case of loss to the exchequer. “If no one says there is any loss, then where is the case?” asked Kumar. Following this explosive allegation by a cabinet colleague, the ensuing debate was then immediately diverted to what is an inconsequential issue. That of divestment vs dilution. We refuse to even dignify the question. What difference does it make ? You can pour coke over ice cubes or you can put ice cubes into a glass of coke. The end result is the same. The end result is this : Foreign partners acquired controlling stake in Indian licensees. Indian licensees in turn suddenly were holding 40% of a 10,000 Cr company (Uninor) with 6000 Cr in cash. The reason why this is sought to be made a big deal is – the company law (Sec 81) was changed to put curbs on divestment to foreign companies but dilution was okayed. In other words, they merely redefined the nomenclature – issuing extra shares was technically not to be called a ‘sale’. So by stressing on this point, they want to drive home the point that what the licensees did was “legal”. And we, the impoverishes citizens of this country are all supposed to pack our bags and go home – just because of technicalities. In any case here is the relevant section of the act. A simple board resolution can provide green cover. Government approval is a mere technicality because these companies did not have any operations or assets other than the licenses. All it needs to do is: (a) pass a special resolution at a general meeting (support of 75 per cent of members attending the meeting and voting) or (b) hold a show of hands or poll with the rider that the “central government is satisfied, on an application made by the board of directors in this behalf, that the proposal is most beneficial to the company”. This brings us to the other key point everyone is missing. The government makes the laws stupid. The government cannot use the ‘show me which law’ has been broken argument. It is enough to show that they did not act in good faith. Why ? Because they make the laws. Look at what Raja said today. So instead of talking about good faith actions – here we have the crazy argument about the company law was broken by the people who make the company law. Bizarre!! See the law does not call dilution of shares as technically a sale. Ergo, there was really no sale – so no question of profits. Yes, but these guys entered the Forbes Billionaires list in 2009 in positions #49 and #50. Is Forbes wrong ? Overnight they are 40% owners of 10,000 Cr companies and debut in Davos. Sibal displayed amazing brazenness on TV last night. He essentially showed us the underbelly of our political-corporate system (and it is not a pretty sight). We are told – this is normal economic activity. Billionaires created out of thin air riding on cheap assets won from govt. Wow!! Entrepreneurs get dirt cheap assets then rope in a foreign investor and make huge profits. He really said that. These bizmen then provide services to people. He forgets to mention they charge for these services. He taunted Arnab Goswami saying his channel too had a foreign investor. Even a child knows the comparison fails because Times brings a lot of value/assets due to decades media. He again said there is zero loss because it had to be first come first served. And if it were FCFS the price had to be 1600 Cr the same as 2001. Really ? Why ? I’d like to buy Sibals estates for 25,000 rupees. Will he sell it ? He pretends like these policies are from God and the government is helpless to change it. Overall he betrays a total absence of good faith action by the UPA. They failed to act as a curator for a scarce natural resource. Sibal taunted – “Which section of IPC did they violate ?”. A despicable attempt to lower the level of debate. Like I said above, the government makes the laws. So it is strange he wants to hide in these very laws. Nevertheless – let me start by saying “409, 415 Criminal breach of trust – cheating”. Sought to draw a parallel between mining and spectrum. Fine then he should have no problem cancelling all mining leases and cancelling all 122 licenses (along with the 4.4Mhz startup spectrum). I request readers not to get distracted by this meaningless construct. It walks , swims, quacks like a duck. Draw your own conclusions. Next we will look at why cancellation of all 122 licenses is the right and the only way forward. The arguments put forth against cancellation include. If there are any other arguments please mention them in the comments section or on twitter at twitter.com/realitycheckind. We need to refute each one of them. Nothing is greater than recovering national loss.